Looking good while fighting evil. I chose to make the boots yellow to bring out all of those wonderful gold accents, and because well, there needed to be something to lighten up the expanse of subued forest green and crimson! 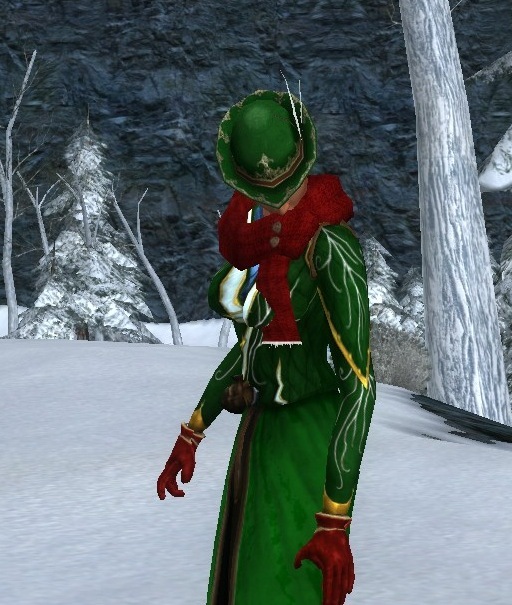 I had planned on using the Yule cap, but then had a eureka! moment when I realized the extravagant festival cap not only had gold filigree on it that matched the piping on the gloves and chest piece, but also had a perfect white feather to go with the white on the chest! I didn’t notice until I put it all together, but the point of the brim also echoes the shape of the gold piping on the shoulders, and the brown hat-band is perfect with the brown buttons on the scarf and the brown on the shirt and skirt. Amazing. This is one of those funny outfits that I actually like better from the back. 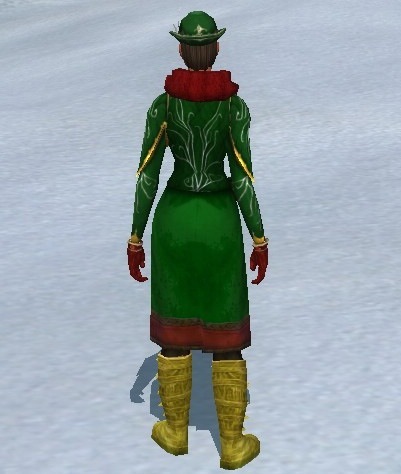 I absolutely love how the crimson scarf and the crimson banding at the bottom of tavol-socas look together, and as a bonus from the back you can’t see the horrible clipping on the boots and scarf. This marks the first time I went crazy on the AH for an outfit. 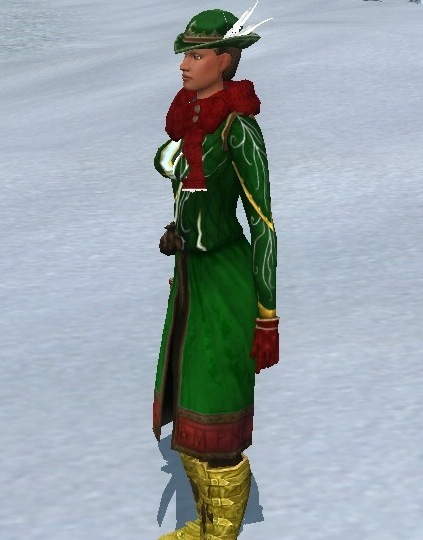 That skirt, Tavol-Socas, is a level 75 light armour piece. I am a Guardian and was somewhere nearing 40 when this was made. I still feel it was gold well spent. A kin-mate was kind enough to make the Rock-climber’s Armour for me, so that at least was free, though still the wrong type of armour, and still above my level.